I love sweet potato in any form…Baked, roasted, chips, mashed….This is one of my new favourite ways to eat it. Extremely simple to make and the combination of flavours makes for an interesting light meal. If you are also a sweet potato fan – give it a try! I adapted this recipe from here. The cheese filling is delicious. It does not taste like conventional cheese, but it has a ricotta-like texture and the nutritional yeast does give it a cheesy taste. 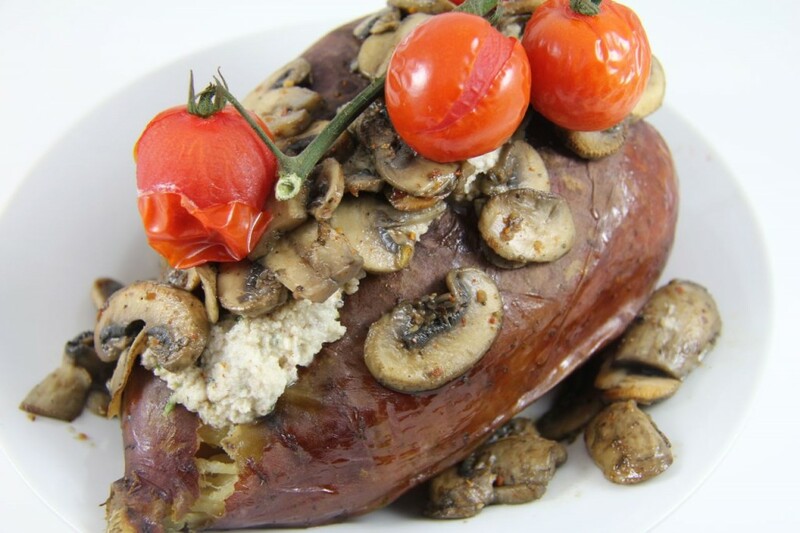 I love the flavour explosion in my mouth of combining the spiciness of the mushrooms, the sweetness of the potato and the creamy cheesy taste of the cheese. Yummm…. Prepare the filling while your sweet potatoes are baking. Slice your mushrooms and saute in olive oil, seasoning with your favourite spicy salt – I used cajun spice, but any spicy seasoning will do. When the mushrooms are done, remove them from the pan and set aside. To make the “cheese” stuffing, place nuts, water, nutritional yeast, lemon juice and salt into your food processor and process until smooth. Taste and salt to desired level. Just 5 minutes before you want to remove the sweet potatoes from the oven, sprinkle a few drops of olive oil onto the baby tomatoes and pop them into the oven. Remove them after about 5 minutes or when they are just starting to burst open. 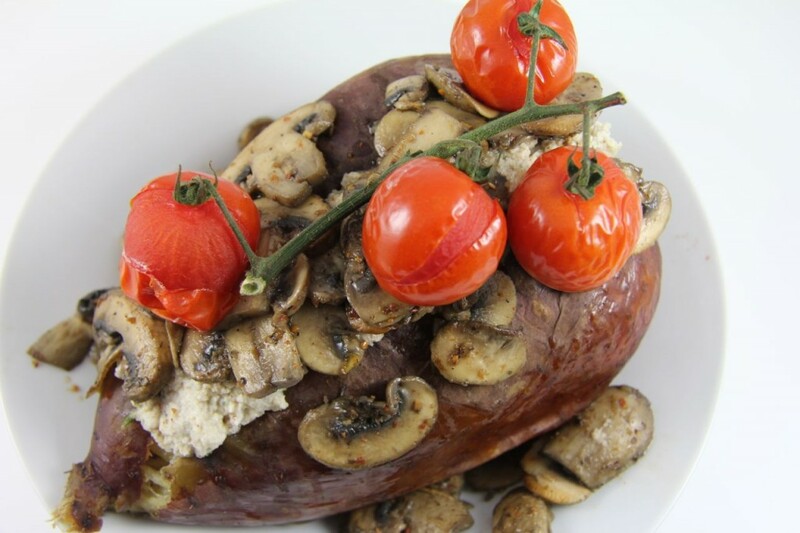 Remove foil from sweet potato, cut a slit down the middle, fill the gap with the “cheese” and top with mushrooms and tomatoes.